AIM Computer Classes: July - Sept. The ion source and low-energy beam transport system for the SNS have been built and are now being tested at the site of the old SuperHILAC. A major milestone in the development of the Spallation Neutron Source (SNS) -- the accelerator-based facility that will provide the most intense pulsed-beams of neutrons ever available for scientific research and industrial development -- has been achieved at Berkeley Lab. A startup negative hydrogen ion source and low-energy beam transport (LEBT) system, the first two components of the SNS "front-end system," have been built and are now undergoing commissioning tests. Results so far could not have been better. "We have met the time-schedule and are beating the requirements," says physicist Rod Keller, senior team leader of the SNS Front-End Group, which is a part of the Ion Beam Technologies (IBT) program under the Accelerator and Fusion Research Division (AFRD). On April 26, physicist Rainer Thomas and his team, working out of the building (71) that once housed the SuperHILAC, fired up their ion source/LEBT and successfully produced an intense beam of negative hydrogen ions (peak current of 46-milliamperes) at pulse lengths of 200 microseconds. The beam was measured in a Faraday cup at the end of the LEBT. Less than two months later, high current pulses of the required one millisecond length are being routinely achieved. Says Keller, "Our ion source current exceeds the startup requirement for neutron production from the SNS facility and is a significant step towards fulfilling the conditions for full-power operation." The SNS project is a collaboration between Berkeley Lab and Argonne, Brookhaven, Jefferson, Los Alamos, and Oak Ridge national laboratories. When construction at Oak Ridge is complete and it goes online (scheduled for the year 2006), the SNS will be capable of delivering an average of two million watts of neutron beam power onto a target, more than 10 times the capacity of today's most powerful pulsed neutron sources. The scattering of these neutrons when they strike experimental samples will reveal to scientists and engineers the most intimate structural details of a wide range of materials. The SNS generates its neutron beams through the combination of a linear accelerator (linac) and accumulator ring, which result in the production of a pulsed beam of protons, energized to about one billion electrons volts (1 GeV), that gets smashed 60 times a second into a target of liquid mercury. This yields a pulsed beam of hot neutrons that are immediately cooled to room temperature or lower and directed into samples for non-destructive neutron scattering studies. Each of the collaborating national labs has been delegated a specific responsibility. Berkeley Lab was made responsible the front-end system based on the demonstrated expertise of the IBT program. "Having recently consolidated this expertise into a single AFRD program, we were the natural choice to take on this challenge," says IBT program head, Rick Gough. "No one had ever demonstrated that the SNS front-end performance requirements could actually be met. A substantial level of R&D was required, and the results of these efforts are now paying off." Ultimately, the SNS front-end system will consist of the ion source and LEBT, a radio-frequency quadrupole (RFQ) accelerator, and a medium-energy beam transport (MEBT) system. The goal is to accelerate a beam of negative hydrogen ions to 2.5 million electron volts (MeV) and deliver it to the linac. Negative hydrogen ions are utilized in the front-end system and the linac because they lend themselves to efficient injection into the accumulator ring. As the beam enters the ring it passes through a foil that strips the negative hydrogen ions of their electrons, converting them into positively-charged hydrogen ions or protons. "This charge-exchange injection process is very efficient," says Keller, "but it can only be accomplished through the use of negative ions." 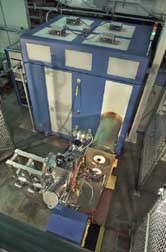 The negative ion source constructed by the SNS Front-End Group is based on the "volume production" technology first developed by AFRD physicist Ka-Ngo Leung as part of the magnetic fusion energy effort. With this technique, negative ions are produced through atomic processes taking place within a confined volume of plasma, rather than through a reaction with a metal surface. When tiny quantities of cesium are added to the plasma, such sources require less power to produce the needed density of negative ions and offer long-term, dependable service. However, because the LEBT is more positively charged than the ion source, it extracts both negative hydrogen ions and electrons from the plasma. "A major challenge during the commissioning of the front-end ion source/ LEBT is to find the most effective way to separate the electrons from the negative hydrogen ions so that only the ions continue to be transported," says Keller. The Front-End Group appears to have solved this problem by using a magnetic field to "kick" the electrons out of the beam, and tilting the ion source at a small angle (about 3 degrees) relative to the LEBT in order to compensate for the slight deflection imparted to the ions. In addition to accelerating and transporting the negative hydrogen ion beam, the LEBT is also required to chop the beam into mini-pulses of 645 nanoseconds duration with separations of 300 nanoseconds. This is necessary to allow the extraction-kicker magnet in the SNS accumulator ring to rise to its full strength. At that point, the accumulated beam can be directed towards the spallation target without spilling the high energy ions on the vacuum chamber. Learning how to best manage and operate the LEBT is a major task of the commissioning effort. Later this year, an RFQ accelerator designed by physicist John Staples will also be added to the system. A production front-end system which will include the MEBT is scheduled to be installed at Oak Ridge in 2002. More than 40 members have contributed to the SNS Front-End Group. Other key persons on the project include project manager Ron Yourd, chief engineer Richard DiGennaro, and lead electrical systems engineer Alex Ratti. At 9 p.m. EDT on June 12, scientists at the Brookhaven National Laboratory recorded the first head-on collisions between the nuclei of gold atoms inside the Relativistic Heavy Ion Collider (RHIC), the newest and largest particle collider ever built for nuclear physics studies. The collisions at RHIC were recorded on a huge detector called STAR (Solenoidal Tracker At RHIC), the heart of which is a Time Projection Chamber (TPC) designed and built by researchers here at Berkeley Lab. "We are crossing into a new frontier of scientific inquiry," said Energy Secretary Bill Richardson. "Scientists from around the world will use this facility to answer some of the most basic questions about the properties of matter and the evolution of our universe." 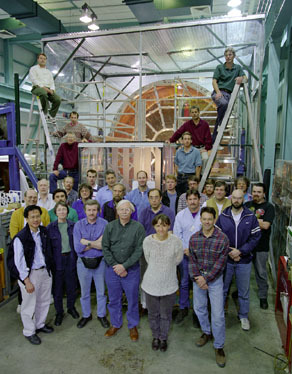 The Berkeley Lab team that worked on the STAR TPC in front of the detector. Berkeley Lab Director Charles Shank said the milestone represents another success in the impressive legacy of contributions this Laboratory and its scientists have made to nuclear science research. "We are proud to be an active participant in this international collaboration," he said. "This achievement signals the beginning of an exciting new period of nuclear exploration and discovery." RHIC actually consists of two giant accelerator rings, each 3.8 kilometers (2.4 miles) in circumference and containing more than 1,700 superconducting magnets. These magnets steer ions of gold atoms -- gold nuclei stripped of their electrons -- in tight beams around the rings at near-light speed until they have been accelerated to energies as high 100 billion electron volts (100 GeV) per nucleon. Upon reaching peak energies, the dual beams of gold nuclei are stored in the rings and forced to cross paths at six different intersections. This subatomic demolition derby yields thousands of collisions every second at 10 times the energy reached in the heavy ion experiments at CERN. 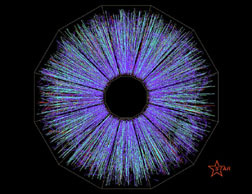 The temperature of the nuclear matter in these collisions is expected to approach one trillion degrees above absolute zero, hot enough to "melt" the gold nuclei into their constituent quarks and gluons and allow these normally bound particles to briefly exist free of one another in a soup-like quark-gluon plasma (QGP). A QGP is a state of matter believed to have last existed a few millionths of a second after the Big Bang that created our universe. Recreating this primordial state of matter in RHIC and studying its properties should help scientists explain the origins of protons, neutrons and other elementary particles and learn how they manage to combine to create the diverse forms of matter we see today. A better understanding of QGP might also help explain why the universe has its current structure. Four experiments have initially been set up to capture and analyze the results of the collisions at RHIC. One of the largest of these experiments is STAR, which is designed to search for the tell-tale signatures of QGP formation by simultaneously tracking and identifying thousands of particles in the debris. STAR will also be used to investigate the behavior of strongly interacting matter at high energy density. The centerpiece of STAR is the TPC. Invented in 1974 by Berkeley Lab physicist and detector expert David Nygren, TPCs are barrel-shaped, gas-filled detectors with sophisticated electronics plastered on the end. A TPC can clearly distinguish between similar types of particles by translating the spatial position of their tracks into the time it takes the signals to drift through a given distance in a gas. TPCs are unique in that they can detect and sift through thousands of particles at once. Construction of the $20 million TPC for STAR, which involved more than 40 Berkeley Lab scientists and engineers, was led by physicist Howard Wieman of the Nuclear Science Division (NSD). Construction of the entire $60 million STAR detection system was overseen by NSD physicist Jay Marx, a veteran of overseeing other big construction projects such as the Advanced Light Source. Says Marx, "After so many years of hard work by so many people it's thrilling to see the first pictures from STAR. Now comes the most exciting part -- trying to understand what nature is telling us about how nuclear matter behaves in the extreme conditions that existed only a few millionths of a second after the Big Bang." Construction of the STAR TPC was completed in 1997. After it passed all commissioning tests with flying colors, the machine was transported to Brookhaven in November of 1998 via a C5A cargo plane. Some 200 scientists and engineers representing 26 institutions here and abroad will be participating in the STAR experiment, which is led by former NSD physicist John Harris, now at Yale University. Among these participants will be NSD physicist Hans-Georg Ritter, one of the leading authorities on QGP. Says Ritter about the recording of the first collisions at RHIC, "It shows that this collider works and that STAR works beautifully. We should be able to begin collecting data within the next few weeks." 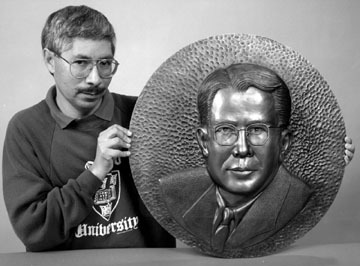 Each morning as we drive up Cyclotron Road winding towards the main gate, we pass by the striking bronze relief of Lab founder Ernest Lawrence. The large medallion seems to belong to that spot, timeless as the trees hugging the surrounding hillside. But this piece of art is only four years old, the creation of one of the Lab's most prolific if little known resident artists. Flavio Robles, Jr. of the Technical and Electronic Information Department is the face behind the face that welcomes visitors to the Lab. He is also the face behind many other works of art that are, in their own way, as integral to the work being done at Berkeley Lab as some of the science itself. It is easy to underestimate how complementary science and art can be, or how great the need to employ art to bring abstract scientific notions to life. "What artists aspire to is to take ideas and emotions and translate them into something people can identify with on some level," Robles says. Take the theory of supersymmetry, or SUSY -- a possible successor to the standard model of fundamental particles and interactions. How in the world do you graphically depict vibrating strings theoretically interacting in a multidimensional universe? There is no right or wrong way. But there are ways that grab our imagination and others that do not, and that's where a good artist can make a crucial difference. Without a visual clue, those of us who are scientifically challenged would be lost. 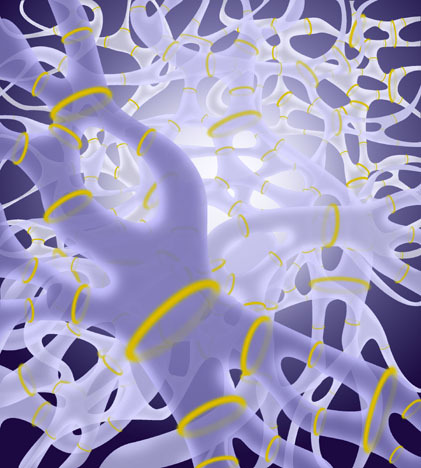 With an illustration such as the one Robles fashioned for the Fall 1998 issue of Research Review we can visually navigate through the most complex web of scientific notions (see Page 5). Other illustrations created by Robles at Berkeley Lab include the award- winning Nuclear Science Wall Chart and NERSC posters, technical illustrations for various scientists and groups, and art for publications such as Research Review. Illustrations of scientific topics that are both highly technical and abstract, such as supersymmetry ("SUSY") require the use of creative approaches that blend art and science. This image, published in the Fall 1998 issue of Research Review, depicts fundamental entities of superstring theory. But Robles' talents extend beyond technical illustrations or even visual arts. They range from calligraphy and painting to poetry; and from printmaking to playing the piano and composing symphonies. Robles taps into his imagination continuously, always finding new ways to express himself. What makes the transition from one art form to another so easy for him, he says, is the common thread uniting these disciplines, all of which draw on what he calls "universal ideas of life, death and the human condition." Robles is philosophical about his craft and views the creative process as something not unlike the work scientists do as part of their discovery process. "You come across `happy accidents,'" he says. "You start with a certain approach and never know what will come out. You're not always in control, but you have to let it come through. People call it intuition." And like scientists, he says, you have to let your dreams and thoughts run ahead of you. "I believe that the universe is smaller than our imagination. We can imagine things that are greater than what's real." The son of California migrant farm workers, Robles relied exclusively on his imagination in his early years, with no formal instruction or others to emulate. His family encouraged his passion for art but never realized his talent was out of the ordinary. 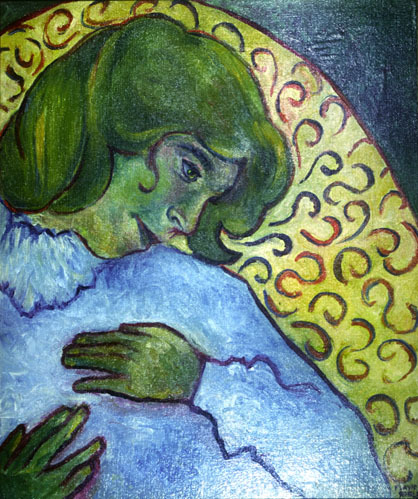 A Girl Remembering, one of Robles' favorite oil painting works. Starting in first grade teachers noticed his talent for drawing and painting and encouraged it along the way. By the time he was in high school, Robles discovered other outlets for his imagination, including writing and poetry. "They asked us to rewrite the last chapter of Cyrano de Bergerac," he said. "And of course when I did it, it came out with a happy ending. The teacher told me I have an ability to write." He went on to study visual arts at Chabot Community College and then painting and printmaking (from lithography to metal etching) at California State University, Hayward. Robles began his career at Berkeley Lab in 1984 at Donner Lab. Back then everything was done by hand with drawing boards and paste-ups. When computers became the prime tools for technical illustrations one might have expected an artist like Robles to be taken aback. After all, he was used to spend his days up to his elbows in clay, or on all fours carving, cutting or pasting. Now he would have to sit eight hours a day in front of a monitor drawing pixels with a mouse. As it turned out, the transition was seamless. "An artist is not in love with the brushes and the paint, but with what they're getting used for," he says. "It's the same with computers." The major difference between the art he does for the Lab and fine art, he says, is the source of inspiration. Technical illustrations involve an interactive process, combining requests from scientists with ideas from within. For fine art the imagination comes mostly from the soul, in a process Robles describes as intensely spiritual. And, he adds, "It helps to be in love. That's the greatest inspiration." Although his interests are multidirectional, outside his job Robles likes to focus on one art form at a time. And for now he has traded his paint brushes for computer music software and a career as a romantic composer. His love of music started when he first sat down at the piano in his last year of high school. "It seemed as though I had done it before, like a dream," he says. "People thought I had played it for a while. Well, I had. For half an hour." Robles taught himself to read and write music -- and found a new vocation. Quiet and introspective, Robles is content to sit alone for hours. Unlike most artists, he never seeks the limelight and is unlikely to ever find himself on a stage. Even after discovering his musical talent, he had no desire to play for others. "Right away I wanted to compose rather than perform," he says. Recently Robles finished his first symphony, subtitled The Bliss, which he made available on CDs. The abstract musical style of the piece breaks with traditional symphonic form in favor of what he describes as a freer style, "one in which we are taken on a journey into the self." Robles would like to write another eight symphonies, including an epic one in seven movements using cross-cultural instruments. Robles is not surprised that many great scientists -- from Einstein to researchers he comes in contact with on a regular basis -- are also accomplished musicians. "There's math in the structure of music, and it's very much appreciated by physicists," Robles says. "There's a lot of common ground, except," he quips, "artists are more eccentric." As a result he feels a connection to the world of science and enjoys the interaction with scientists, which sometimes include philosophical discussions. "It's a real blessing to work here," Robles says. "I'm able to use my creativity and I'm appreciated for it." One of his major goals now is to take some of the art he created over his life and combine it in a multimedia show. An even loftier life-long dream of his is to pursue what he considers to be the highest art form: sculpture -- particularly sculpting in marble. After all, there's a reason why he named his little brother after the greatest master of all time. "It would be a big challenge," he says, knowing that sculpture is far less forgiving than other art forms. "There are no mistakes in sculpting. You chip away, and if you chip too much, it's an ashtray." Meanwhile, he feels fortunate to work here, to be paid to create, and still have time to pursue other artistic ventures in his free time. And often he is as awed by the product of his skill and imagination as is everyone else. "When I see the results of my work sometimes I can't believe I did that," Robles says. "It's a very humbling experience. And I'm very thankful." By day, she writes software and is a webmaster in the Environmental Energy Technologies Division. But there's another side to Margaret Pinckard: she sings and plays the Celtic harp. While recording harp music solos for a CD, Pinckard met fellow harper and singer Deborah Bennett. Months later, following an afternoon of "completely butchering Praetorius," as Pinckard puts it, they decided they were a perfect musical match and formed a Celtic harp duo called Woad (rhymes with road), named after the plant used by the ancient Britons for blue dye. Pinckard and Bennett come from different but complementary musical backgrounds. Pinckard studied operatic voice before discovering Celtic music on the harp, while Bennett's Celtic roots led her to study harp at the Royal Irish Academy of Music. Since 1998 they have performed as a duo in coffeehouses, churches and private concerts, as well as at the Highland Games in Pleasanton. They have also lectured about Celtic music in various Bay Area schools and adult education programs. In July, Woad will perform at HarpCon 2000 in Monterey, a biannual folk harp conference sponsored by the International Society of Folk Harpers and Craftsmen. Berkeley Lab Director Charles V. Shank will give his annual State of the Laboratory address at noon on Tuesday, June 27, in the Bldg. 50 auditorium. As in past years, the talk will be broadcast live to the Bldg. 66 auditorium. The Director will review Laboratory accomplishments during the past year and look ahead to future challenges. All employees are invited to attend. Recent discoveries regarding the fate of the universe, including the work of Berkeley Lab's Saul Perlmutter of the Supernova Cosmology Project, were the subject of the June 5 edition of the ABC News show Nightline. "How is it all going to end?" was the scientific and philosophical question raised by ABC reporter Robert Krulwich. Specifically, the show focused on scientists' attempt to determine the pace at which the universe is expanding and what this expansion rate bodes for the future of the universe. Perlmutter described studies of very distant supernovae which led to the discovery that the universe's expansion is speeding up, not slowing down due to gravity, as had been expected. "I wanted to find out whether or not the universe was going to last forever," Perlmutter said. The emerging theory of the runaway universe -- Science magazine's Breakthrough of the Year for 1998 -- implies the existence of a self-repelling property of space, a "pushy energy," as Krulwich referred to it during the show, which will "make all empty spaces bigger and then bigger, eventually pushing even galaxies away from each other." Also prominently featured on Nightline was Brian Schmidt of Australia's Mount Stromlo and Siding Springs Observatories. A summary of the show, as well as a full transcript and a partial video, are available on the Nightline website at http://abcnews.go.com/onair/Nightline/nl000605_universe_feature.html. An advanced insulating material developed by Berkeley Lab research-ers has been licensed by San Diego start-up Cargo Technologies, Inc. for use in a thermal packaging liner that will be used to ship perishable cargo such as foods and pharmaceuticals. The product -- AirLiner -- will utilize gas-filled panels (GFPs) made out of many layers of thin, aluminized plastic sheets shaped into a honeycomb pattern and filled with a gas. AirLiner can be inflated either with ordinary air or, for ever better thermal performance, with an inert gas (argon, krypton or xenon). The insulating value of the panel depends on the gas used, ranging from R-5 per inch (air-filled) to R-20 per inch (xenon-filled). By comparison, fiberglass insulation is rated at about R-4 per inch. In 1991 the GFPs won the Grand Prize for Home Technology in Popular Science's "Best of What's New" awards. AirLiner is an inflatable insulating bag that converts an ordinary corrugated box into a cooler to keep perishables fresh and cold during shipping. The growing market for insulated packaging used to ship perishable cargo by air alone is estimated Cargo Technology at more than half a billion dollars per year in the U.S. 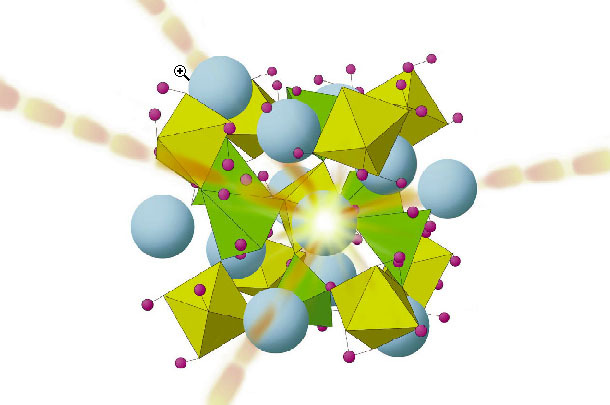 Researchers in Berkeley Lab's Environmental Energy Technologies Division developed GFPs as a spin-off of their research on superwindows in the 1980s. Superwindows are double- or triple-paned, energy-efficient windows with infrared-reflective coatings and inert gases filling spaces between panes for extra insulation. Since then, GFPs have been used as thermal insulation in a variety of applications, notably in studies of prototype energy-efficient cars and appliances and as a potential insulating material in building construction. "We are hopeful that this market success will motivate others in the building and appliance field to look again at this interesting, high performance insulation technology," says Stephen Selkowitz, head of EET Division's Building Technologies Department. The rainbow flag placed on the fence outside Bldg. 65 in celebration of Gay Pride Month disappeared on Sunday, June 4, just three days after it was hung up on behalf of the Gay, Lesbian, Bisexual, Transgender and Friends Employee Activities Association (GLBTF), a Laboratory sanctioned group. Because of the way the nylon cord was cut, GLBTF representatives said, it appeared that the flag was removed deliberately. Berkeley Lab Director Charles V. Shank expressed immediate outrage over this incident. "I was distressed to learn about the unauthorized removal of the rainbow flag," he wrote in a Level 1 message. "Removing the flag was inappropriate, and I want to make it clear that actions of this kind will not be tolerated. I ask all employees to be vigilant for any form of harassment." A new flag was purchased last week and hung back on the fence by Bldg. 65. The disappearance of the flag was reported to Lab Security. According to Paul Harris, president of GLBTF, the Security Office has committed to doing regular checks to assure the security of the banner. Wrote Director Shank, "I want to restate Berkeley Lab's commitment to providing an environment which values all of our people and is supportive of diversity." DOE officials plan to implement new orders on technology partnering and CRADAs that would formalize department policies but would not otherwise contain any substantive changes in the way DOE and its laboratories and other facilities transfer technologies to industry and academia. "These new orders will formalize a lot of things that have been implicit and diffuse," said David Heyman, a senior adviser to Energy Secretary Bill Richardson. DOE intends to adopt the orders in mid-July. The CRADA order will be accompanied by a manual that would spell out department procedures for collaborative agreements between the labs and the private sector. The new DOE orders are an outgrowth of a report on tech transfer issued last year by Under Secretary Ernest Moniz, which called for a number of steps to make DOE-developed technologies more readily available. Heyman said the orders may be one of the last major actions DOE can take on this topic during the Clinton Administration. A report from the General Accounting Office (GAO) has praised the DOE for assuring merit reviews of scientific projects in the Offices of Basic Energy Sciences (OBES) and Power Technologies. The report applauded the DOE process for "setting out what types of reviews will be performed, what criteria will be used in the evaluations, and how individual reviewers' comments will be used by those making [financial] award decisions." The report on merit reviews addresses more than 150 projects funded by the two offices in FY98 and FY99. It follows a March 1999 report by GAO on peer review at the DOE. DOE defines merit review as "a thorough, consistent and objective evaluation process using specified criteria and the review and advice of qualified peers." OBES requires merit reviews for all of its research, except those projects mandated by Congress. "The reviewers normally are persons familiar with the science required by the project, but not closely associated with the particular research or organizations involved," the GAO report said. The reviewers used by OBES focus primarily on the scientific merit of projects and the practicality of the proposed research methods. They also consider the competency of the researchers who will work on the projects and the budgets assigned to the work. Melvin P. Klein, a biophysicist noted for applying advanced experimental techniques to biological problems, died suddenly at his home in Berkeley on Sunday, May 28. He was 78. Klein was a senior physicist, emeritus in the Physical Biosciences Division and a member of the Chemistry Department at UC Berkeley. At the time of his death he was actively pursuing research into the oxygen-evolving system in plants -- the source of the world's oxygen supply -- a field to which he had made fundamental contributions for the past quarter century. Mel Klein studied the electronic properties of proteins with ALS' beamline 9.3.1, which he helped design and build. Karen McFarlane of Physical Biosciences is shown in the foreground of this recent picture. Born in Denver in 1921, as a boy Klein was an enthusiastic gadgeteer -- by age 11 he was a ham radio operator. He studied engineering at the University of Denver, and during World War II he served as a civilian radio engineer for the Army Air Corps, the Office of War Information, the Harvard Radio Research Laboratory, and the intelligence section of Gen. Douglass MacArthur's forces in the Pacific. At UC Berkeley after the war he concentrated on physics and biophysics after a year in medical school, and received his A.B. in 1952 and his Ph.D. in biophysics in 1958. Meanwhile, he joined the Lab, then known as the UC Radiation Laboratory. While working on instrumentation for the Rad Lab's giant proton linear accelerator near Livermore in the early 1950s, he became interested in the phenomenon of nuclear magnetic resonance (NMR), which was yet to be applied to medical imaging. With a colleague he developed a digital computer-based signal averaging technique which, said Berkeley Lab Director Charles Shank, became "the sine qua non of modern Fourier transform NMR spectroscopy and has permeated most fields of experimental science." After spending a year at Bell Labs in New Jersey, Klein returned to the Bay Area and in 1963 joined the laboratory run by Melvin Calvin on the Berkeley campus -- today's Calvin Lab -- where he was named senior staff scientist as part of Berkeley Lab's Chemical Biodynamics Division. Except for brief sabbaticals (in Paris on a Guggenheim Fellowship in 1966-67 and in Berlin on a Humboldt Award in 1988-89), plus a very brief retirement in 1991, Klein devoted the rest of his career to biophysics in Berkeley. Klein was a world-renowned leader in developing applications of NMR and many other measurement techniques to biophysical problems. 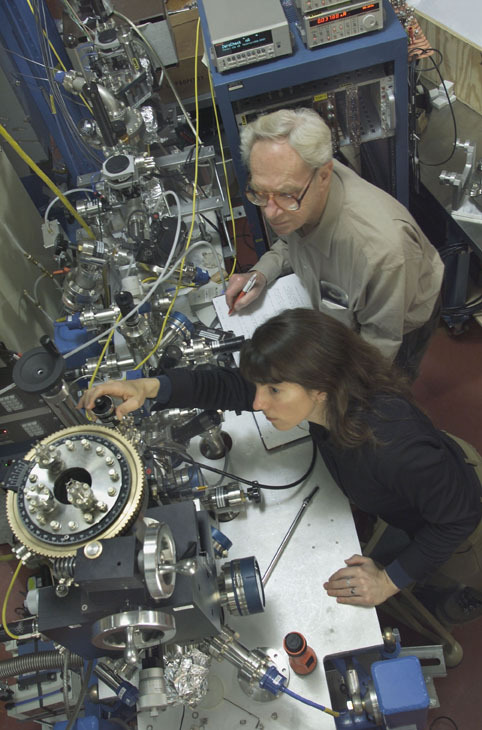 Notable was his work on synchrotron-based x-ray spectroscopy. Klein was instrumental in establishing biological research facilities at Berkeley Lab's Advanced Light Source. In announcing Klein's death, Graham Fleming, director of the Physical Biosciences Division, wrote, "Mel embodied the spirit of curiosity and interest in the world around him that marks a true scientist and an intellectual ... To say he will be terribly missed is an insufficient expression of our loss." Klein's longtime collaborator on photosynthesis, Kenneth Sauer, said, "He was a gentle soul and at the same time a great teacher and leader who inspired students and postdocs and hundreds of good friends around the world." In October 1998, in a special issue of the Journal of Physical Chemistry devoted to Klein and Sauer, their Berkeley Lab colleague Alexander Pines wrote that "Mel Klein has educated generations of students and postdocs, many of whom have gone on to stellar careers, and he has been and remains an enduring inspiration to us all. But Mel also has that rarest of human qualities, he is a mensch, a real mensch. Dear Mel ... you have earned our love and our respect." Klein is survived by his wife of 40 years, Margaret, their daughter Adrienne, sons Mark and Peter, and two grandchildren. A memorial service was held at the UC Berkeley Faculty Club last Friday, June 9. In lieu of flowers, the family asks that donations be made to Joint Medical Program Student Support, c/o Nina Green, 570 University Hall, University of California, Berkeley, CA 94720-1190. Reminder: A memorial service for Klaus Halbach, who died on May 11, will be held on Wednesday, May 28 at 3 p.m. in the Brazilian Room in Berkeley's Tilden Park. Halbach was an internationally-renowned expert in the fields of magnet design and accelerator physics (see Currents, May 19). Noted Hollywood screenwriter Michael Tolkin, who wrote the screenplay for the ultimate Hollywood-insider movie, The Player, as well as the novel on which it was based, made a morning visit to Berkeley Lab last week to research his latest script assignment, The Hulk. Yes, that Hulk -- the green one. Although based on a comic book, and mostly concerned with what might be called "anger management," the story's main character in his better moods is some sort of scientist. Tolkin's concern is to make the scientific background of the movie, which is set in Berkeley, seem at least plausible. The challenge seems daunting, but Tolkin may be able to bring it off. One of his recent projects was 1998's Deep Impact, one of the few big-rock-hits-the-Earth movies that got respectable reviews even in the pages of Science magazine. Ironically, The Hulk's producer, Gale Ann Hurd, coproduced the other big-rock movie of 1998, Armageddon, a box-office smash but wide scientific miss -- not to mention such science-fiction thrillers as The Abyss, Aliens, Terminator 2, Dante's Peak, Virus, and many others. At the 88-Inch Cyclotron, Tolkin discussed the Gammasphere experiment with Paul Fallon and Rod Clark of the Nuclear Science Division. And at the Advanced Light Source he spoke with Carolyn Larabell of the Life Sciences Division about cell imaging with optical and x-ray techniques, and with Kristen Balder-Froid and Gerry McDermott of the Physical Biosciences Division about protein crystallography. After a quick tour of the Lab in his chauffeur-driven limousine, Tolkin was off to further interviews on the UC Berkeley campus. His script is due in just three weeks. The Projects Office serves as a hub for the Laboratory's programmatic interactions with federal agencies. It is also a fully-equipped business and communications center for the Lab and its partners, helping facilitate meetings and research interactions both nationally and internationally. The next issue of Currents will have more information about the move. The University of California is conducting a review of Berkeley Lab Director Charles Shank in accordance with its policy to conduct reviews of all campus chancellors and DOE laboratory directors every five years. Employees' input in this process is welcomed. The directors' reviews are performed by a special review board appointed by UC President Richard Atkinson. The Board is chaired by Alan Schriesheim, Director Emeritus of Argonne National Laboratory. The Board first met at Berkeley Lab on June 8 and 9. On June 22 and 23 it will meet again offsite to hear from individuals who have requested to comment in person. Their strict confidentiality will be maintained. Neither the agenda, nor the names of those to be interviewed or who are writing to the Board will be given to anyone other than Board members and one person at the President's Office who serves as staff to the Board, who will keep all correspondence in strict confidence. Written statements may be sent to the chairman of the Review Board, Alan Schriesheim, c/o University of California, Office of Research, 1111 Franklin Street, 11th Floor, Oakland, CA 94607-5200. E-mails may be sent to the chairman in care of the Board's staff at [email protected] The deadline for submitting written statements is June 20. After completion of the process, a statement regarding the outcome of the review will be issued by the UC President. The Employees' Activity Association is sponsoring a Family Day at Great America on Aug. 12 and 13. (You may attend either day.) Admission is $11.50 for adults and children seven and older, $10 for children aged three to six, and free for those under two. Tickets will be sold at the cafeteria entrance on Tuesdays from 12 to 1 p.m. (Checks should be made payable to UC Regents.) For more information contact Lisa Cordova at X5521. The LBNL Dance Club Workshop for this month will be held on Saturday, June 24 from 7 to 11 p.m. at the Berkeley Methodist United Church in Berkeley (1710 Carleton Way). Admission is $10, which will cover the cost of the DJ and refreshments. The session will include instruction and practice. For more information and directions, contact Joy Kono at [email protected] or Sharon Fujimura at [email protected]. Starting with today's sessions, the retirement strategy consultations with Fidelity Investments will be held in the lower conference room of Bldg. 54 (Room 2), instead of Bldg. 65. The next onside consultations will be held on July 14. For more information call Fidelity at (800) 642-7131. The Berkeley Lab Fire Department will host a Home Fire-Safety Fair from 11 a.m. to 1 p.m. on Thursday, June 28, in the cafeteria lobby. Informational displays will feature print materials about home fire and electrical safety issues, including information on home smoke detectors and portable fire extinguishers. Also featured will be materials about earthquake preparedness and ergonomic issues for telecommuters. For more information call Alyce Herrera at X5176 or Lab fire chief Stacy Cox at X6360. An informational meeting will be held next Thursday, June 22, to discuss the formation of a new group which will focus on stress management, meditation, and the development of a positive orientation towards health and well being. The session will meet at noon in the Bldg. 70-191 conference room. The LBNL Tennis club is planning a tournament to be held in Berkeley later this summer after work hours over the several days. The tournament is open to all employees and spouses. Players of all abilities are invited, and the competition will be divided according to level of ability. There is no cost to enter the competition. In order to determine the number of likely participates and finalize plans for the tournament format, organizers of the Tennis Club is currently conducting a labwide survey. If you are interested in participating, e-mail Joe Harkins at [email protected] lbl.gov by June 30. Please provide the following information: name, phone number, level of play (beginner, intermediate or advanced), and whether you have a preference for either singles or doubles. Lab Director Charles Shank is inviting all volunteers and employees who worked at this year's Open House to join him for a reception on Monday, June 26, from 3 to 4 p.m. in the Lab cafeteria. The reception will feature a short video of Open House highlights and a review of survey comments from Open House visitors. The LBNL Karate and Arnis (Pilipino Stick Fighting) Club practices every Tuesday and Thursday from 5 to 6:15 p.m. on the ground floor of Bldg. 51 (the Bevatron). On Wednesday, June 21, an Arnis demonstration will be held at noon on the lawn in front of the cafeteria. Two sections of the AIDS Memorial Quilt, sponsored by the NAMES Project, will be on display in the lobby of the cafeteria on Thursday and Friday, June 22-23. Rick McCormick of the national chapter of the Names Project will speak at noon on June 23 in Perseverance Hall. A donation box will be available. The event is organized as part of Berkeley Lab's observance of June as gay pride month and is hosted by the LBNL Gay, Lesbian, Bisexual, Transgender and Friends Employee Association (GLBTF). On Friday, June 30, the GLBTF will also host a video showing of "It's Elementary," an educational teaching tool used in many school programs. The presentation will be held at noon in the Bldg. 50 auditorium. For more information contact Paul Harris, president of GLBTF, at X4650. VIDEO PRESENTATION OF "IT'S ELEMENTARY"
Items for the calendars may be e-mailed to [email protected], faxed to X6641, or mailed to Bldg. 65B. The deadline for the June 30 issue is 5 p.m. Monday, June 26. "Rare Decays at CLEO" will be presented by Werner Sun of CalTech. "A General Numerical Method for Propagation of the Phase Space Distribution, with Application to the Sawtooth Instability in the SLAC Damping Rings" will be presented by Bob Warnock of SLAC. "From Dynamics to Details: Imaging Cells using Light and Soft X-Ray Microscopy" will be presented by Carolyn Larabell of the Life Sciences Division. "The Invention of the Transistor" will be presented by Michael Riordan of SLAC and the National Museum of American History. AIM, a Walnut Creek-based computer software training firm, provides onsite PC computer courses to Lab employees. Note: All in-house courses at this time are taught on PCs with Windows 98reg.. The 97 series programs are used by the newest version of Microsoft Office for Windows 98reg.. Series 6.x programs for the Mac are nearly identical to the Windows 98reg. versions. For users of a Mac 6.x series or an older Mac or PC version, the material covered in these courses will be applicable. ELMWOOD, woman sought to share eleg 11 rm house w/ 2 men, 1 woman, nonsmoking professionals, master bdrm w/ fireplc, huge closet, shared dinners , piano, dog, laundry, sauna, hardwd flrs, exc neighborhd, $750/mo + dep, shared exp, Tony, 841-4480. Submissions must include name, affiliation, extension, and home phone number. Ads must be submitted in writing: via e-mail ([email protected]), fax (X6641), or delivered/mailed to Bldg. 65B. Ads run one week only unless resubmitted in writing, and are repeated only as space permits. Currents reserves the right to edit ads for space and style. Once submitted for publication, ads may not be retracted for any reason. The deadline for the June 30 issue is Thursday, June 22.